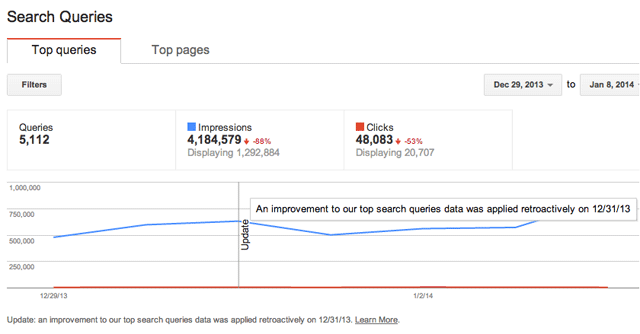 If you visit your Google Webmaster Tools Search Queries report, you will see an "update" line across the graph. When you place your cursor over the update, it reads, "An improvement to our top search queries data was applied retroactively on 12/31/13." Indeed it has! Google is now showing the exact number, they are no longer rounding your search query data to a 'round' number. This now gives you the exact impressions and clicks for a given keyword or page on a specific date or within a specific date range. John Mueller announced this on the Google blog and said on Google+, "the search query data is now no longer bucketed / rounded." Those who use the data for their own reporting via the API are even more excited. Forum discussion at Google+ & WebmasterWorld.